Review What could be more Silicon Valley than inventing a technology to alleviate the inconvenience caused by another you invented? But that's one of the biggest appeals of the Apple Watch. After 18 months of lolling about without a discernible purpose – like a boomerang kid who can't decide what to do with their life – the Watch has become a success. It's one of the nicest luxury purchases an iPhone can make. What a change in fortune. Two years ago I took a couple of stealth shopping expeditions to Apple Stores to see how the ol' Watch, the most hyped technology launch of 2015, was faring. Hardly any Apple Staff were wearing one (most unusual), and in a packed shop there was a weird vacant island around the Watch table. Apple had launched a Watch and it seemed nobody wanted to know. "Piles of unsold smartwatches" was a feature of 2016, and Apple wasn't immune. But a few days later Apple announced the Watch Series 2. It finally gained waterproofing so users could begin to justify it as a luxury fitness gadget. The UI got a radical revamp – it no longer tried to do everything badly. And friends who had one since the start genuinely loved it – because they didn't have to yank out their iPhone so much. Last year's Series 3 introduced a pricey hands-off feature: LTE connectivity. Promising "freedom". Freedom from lugging around an iPhone! Now that many more people seem to fret that the smartphone is an attention-sucking curse, the Watch should have broader appeal. I put this to the test, and this is what I found. First of all, the "freedom" promise must be heavily qualified, for several reasons. You may need to uproot from your existing mobile network as both the iPhone's SIM and Watch's eSIM must be provisioned by the same provider. With some networks, you may need to switch plans (this is to keep the riff-raff out, presumably). Some things only work if the iPhone is on and charged somewhere. You'll only be able to "do SMS" if the iPhone is in this condition, Apple explained in this Support Note. And some services won't work at all. Slack axed its own Watch app, while WhatsApp has never had one in the first place. Then again, this may be a blessing, not a curse. I found the ability to leave the phone at home and go to the pub knowing I could still get important texts and calls – while safely obliterating Slack and WhatsApp – to be a great combination. Freedom++. Not wanting to sound like a broken record, apps don't matter on smartwatches – I was still able to view WhatsApp photos on the watch without a WhatsApp app. With Vodafone as my provider, the setup process took about 45 minutes to get a working LTE watch. While not as fraught as it was for the very first buyers, it could (and should) be better. An online chat told me I had the wrong plan, but this was discovered to be false after 10 minutes talking to a human. I gave the 30-digit EAN number, more waiting, and five minutes after the call ended, I had LTE bars on the watch. Ideally this should be a push button, self-service operation that's as simple as provisioning a dumb phone: just request the settings by text (I just happened to be in a position to put up with hold music for most of half an hour – which is not most days). It's very nice. Apple has enlarged the display area by around 30 per cent, but the size hasn't changed very much – the display goes much closer to the edge. What was the larger (42mm Watch) now has a massive 44mm display. In fact, if legibility was an issue before with the 38mm, the smaller 40mm successor may be all you need. Not that there's a huge difference (around £30) in price between "smaller" and "larger". The big price gap is between non-LTE and LTE models (a £100 premium), and then there's a huge leap to the now-esoteric steel/sapphire combo. So the price of admission to a brand-new Watch is £399 (non-LTE), £499 (LTE) and a whacking £699 for the stainless steel model, which is much fatter and heavier, and gives you weaker Haptic feedback. That's quite a range. Last year's is a much more reasonable £279 (38mm). I found one or two significant advantages over the Series 3. Less obvious is support for HTML in emails – and despite my best efforts to trip it up, it has worked very well indeed. For example, Netflix promo emails render perfectly in miniature. Tap on a PDF attachment and that's legible too. The other big gain is that performance is now even snappier, thanks to Apple's S4, 64-bit application processor. The boost is most noticeable when starting an activity, such as a walk or a run: this is fairly instantaneous now. The improvement for Watch Series 1 or 2 owners will be quite dramatic. As if to emphasise that apps are a waste of time, even Apple's amazing new silicon doesn't help with some wretched experiences. The Moovit travel app wouldn't get going, and the Uber app pestered me to tinker about on the iPhone (which I didn't have with me). But you won't really be using your Watch for apps – this isn't an app platform, and probably never will be. The gimmicks added to Watch 4, which heavily featured in the initial coverage, are also fairly redundant. Watch now does "ECG monitoring", although with just one electrocardiogram sensor this can be highly misleading. Apple also claimed to have FDA approval, but on closer examination it's the same sort of "approval" given to homeopathy kits in Walgreens. There's no regulatory approval yet in the UK, so the feature isn't enabled at all. Fall detection is a nice feature – turned off by default if you're under 65. 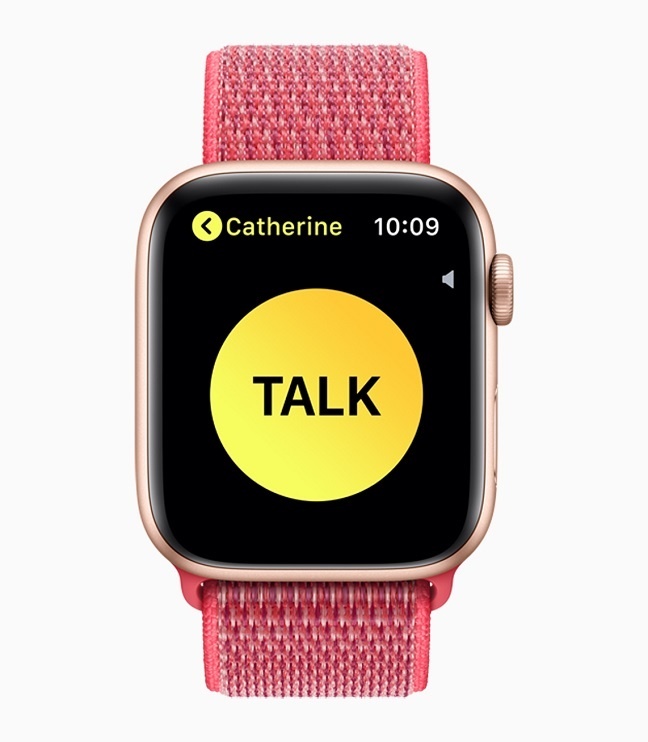 There's also a new Walkie Talkie function, which allows you to blast another Series 4 wearer with half-duplex audio messages. It's daft enough that it doesn't work with other Apple products – but even more bizarre that when you receive one of these audio messages, it will broadcast it on the Watch's speaker, so everyone around you can hear it. I've always had a soft spot for these half-duplex blasts, they can be very appropriate for specific situations ("I'm round the back!") as it's so much quicker than typing a text. But its implementation is most un-Apple-like. The Watch's haptic feedback is now stronger and more subtle, and has been added to the crown. Fears that the Side Button would become capacitive were groundless – it's a proper clicky mechanical one, as before. The Watch's speaker is now terrific – I was able to hear the other caller on calls very well without the other party noticing I was on a Watch. It uses the iPhone's circuitry that for the call when it's within range. LTE is only turned on if you're out of range of the phone – there may be a few seconds where it's switching over – and the green iPhone icon is replaced by four signal-strength bars. I typically got two, reflecting not the signal strength but the relatively weaker antenna of the device. Surprisingly, it didn't impact massively on the battery in LTE mode. But then it was largely in standby mode for the time it was iPhone-free. Even Apple doesn't promise very much talk time: one hour on LTE, two hours when the iPhone is handy. Apple states the same uptime as before, 18 hours, which in practice with a couple of 30-minute walks or runs a day lasts two days. I didn't get more than two days, but usually had plenty leftover at the end of day 1, typically 65 to 75 per cent. If you require GPS tracking for a long bike ride or walk, the battery depletes much more rapidly. Samsung recently introduced workout detection in its Galaxy Watch, and Apple does this, although less aggressively. You get a haptic vibration inviting you to start the tracking. Apple claims it can deliver 10 hours of indoor workout and 6 outdoors with GPS (five on the LTE model). Apple still doesn't permit third-party watch faces, which doesn't bother me, but the lack of basic customisation does, as there isn't a sufficient choice of simple digital faces. I merely want to be able to lash up a decent digital face with a couple of complications. The new "Infograph" face, an attempt to recreate the clutter of the premium fashion analogue watch, is a real pig's ear. It might make sense in monochrome but is a visual disaster when using the standard colour icons. We don't give marks out of 10 any more but right now you could be forgiven for assuming this product was doing well so far: cruising for an 8 or a 9. And if it wasn't for Siri, it would probably get a 9. The common consensus so far has been that Siri is OK for voice recognition but not "smart" – that's something I'd be happy with, as I don't need smart. But even the voice recognition seems to have taken step back. It's immensely useful to have voice commands that work, but infuriating when they don't, and potentially dangerous when causing an additional distraction for a driver or cyclist. 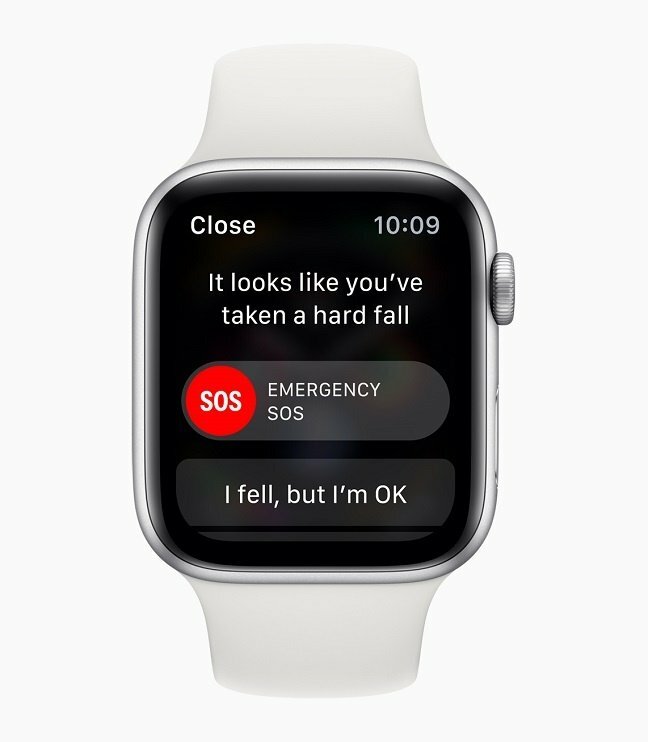 In theory you should able to send a message simply by raising the watch and talking, without even requesting "Hello Siri". You will get accustomed to seeing "Hold on..." a lot. I found the additional step of the Watch checking whether you want to send understandable but annoying (I don't drive and text, but do use voice commands at redlights). Siri is the principal annoyance for Watch 4 owners and it's one of those instances where less would be more: Apple should tailor it doing a few commands well. One non-obvious point arises from using a range of wearables and it isn't mentioned often enough. While the iPhone may not be the best phone (let's park that argument), the combination of iPhone and Watch trumps any other combination. In fact, the Watch is so complementary I'd suggest to anyone thinking of switching to consider getting an older iPhone (the 6s Plus works just fine these days with iOS12) and save the cash for a Watch. Fitness wearables from Garmin and Fitbit and others do a great job, but they don't allow you to cut down gratuitous phone use quite like the Watch does. And this double act is simply in a different universe to the Android + WearOS combo.